One of the real joys of listening to Robin Taylor's work is that one is never quite sure what is going to come out of the speakers when the CD is put on. This was quite a lengthy recording process, with the sessions taking six months to complete, but the result is yet again another wonderful album from the mad Dane. What is particularly interesting on this album is the way that the music moves between progressive rock, soft jazz, fusion, RIO, avant-garde jazz etc. It is a seamless move, something that is definitely enhanced by having three different brass players involved, with Karsten Vogel making an appearance back with Robin for the first time since 'Soundwall'. Robin also brought in renowned Danish guitarist Jon Hemmersam to assist with the solos. As well as playing jazz, Jon has recorded with Evelyn Glennie and has a real understanding of different types of music. Danish project TAYLOR'S UNIVERSE is, as the name implies, a vehicle for the creative mind of Danish composer and musician Robin Taylor, the sole currently active band of his and one which appears to have steadied itself into a release pattern of one full length album each year by now. "Worn Out" is the latest of these, and was issued in January 2013. Taylor's Universe remains a band that continues to supply the world with high quality music blending elements from vintage symphonic rock with details from jazz and the realms of the avant-garde in a peculiar, likeable and accessible manner. Instrumental progressive rock of a peculiar nature that isn't easily comparable to any other artist, and "Worn Out" is an album that documents the quality and creativity of the musicians involved in this venture in a fine manner. 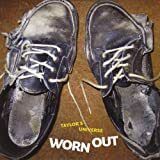 Post a review of TAYLOR'S UNIVERSE "Worn Out"